(Bloomberg) -- Venezuela's government-in-waiting intends to scrap requirements that state-owned oil giant PDVSA keep a controlling stake in joint ventures as it seeks to revive the oil sector and encourage private investment, National Assembly leader Juan Guaido's representative to the U.S. said. The move is part of a broader plan by Guaido, who was declared interim president by the assembly last month, to revive Venezuela's shattered economy by focusing on boosting oil output as soon as possible, said Carlos Vecchio, Guaido's envoy in the U.S. Currently, PDVSA must have a 51 percent stake in all joint projects. "We want to go to an open economy, we want to increase oil production," Vecchio said in an interview Monday during a visit to Bloomberg's Washington office. "The majority of the oil production that we want to increase will be with the private sector." Vecchio ruled out the possibility that Citgo, the U.S. refiner controlled by PDVSA, would file for bankruptcy, saying it was "not necessary." He also mused about the possibility of the White House issuing an executive order protecting Venezuela from creditors as the U.S. once did for Iraq. Asked about the possibility, he called it a "good idea." "We want to keep the operation running" as it is now, Vecchio said of Citgo. Vecchio has emerged as one of the most visible and vocal representatives for Guaido in the days since President Donald Trump declared Nicolas Maduro's regime illegitimate and threw his weight behind Guaido on Jan. 23. Vecchio will attend Trump's State of the Union speech on Tuesday evening as a guest of Florida Senator Marco Rubio. The envoy said the top priority is restoring political stability, followed by rebuilding the economy. He said he hopes elections can be held by year-end. "We want a smooth transition. I hope we can achieve it," he said, adding they seek a negotiated exit for Maduro "that will save more suffering to Venezuelans." Part of the economic challenge involves taking ownership of Venezuela's assets abroad -- for which Guaido declined to give a value -- and gaining control of Citgo's board. While he said Guaido's government wants to name a new board, current employees of the company would continue to work there. He also said he expects to have control of Venezuela's embassy in Washington "this week." Venezuela faces considerable difficulty in rebuilding its oil industry after more than a decade of neglect and a history of hostility toward foreign investors. Venezuela's oil output fell to a 69-year low of 1.339 million barrels a day last year and is already expected to drop below the one-million barrel mark in 2019. Vecchio said the government would honor all "legal" and "financial" debt, but left open the possibility that it wouldn't honor debt agreements that Maduro's regime may have signed without the approval of the National Assembly. "If the signed deal was not approved by the National Assembly we will not recognize that," Vecchio said. He said that Guaido's team has yet to speak with officials from Russia, which continues to support the Maduro regime, or China, which has taken a more neutral stance so far. Analysts estimate that China has lent the country about $70 billion, mostly against future deliveries of oil. Guaido's case as Venezuela's rightful leader gained new weight on Monday, with the U.S. State Department saying that he has been recognized as interim president by 16 more countries, including France, Germany and the U.K. 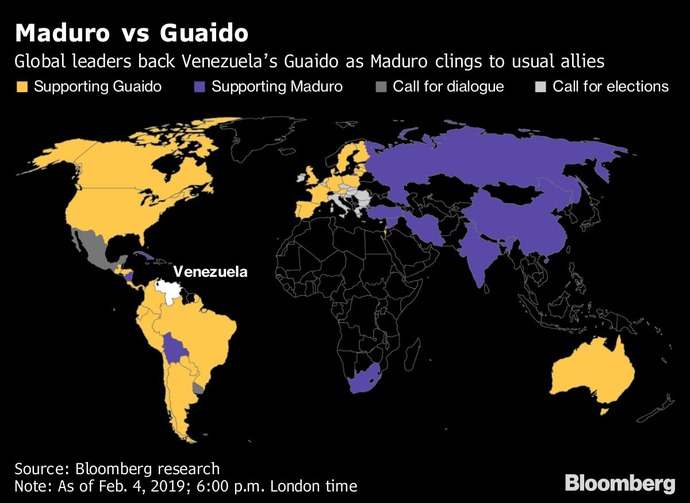 Altogether, the department said, more than 40 countries have declared their support for Guaido. Discussing Venezuela's economic ties with Russia, China and Turkey, he suggested those countries would be wise to recognize that the political tide has turned against Maduro. "We hope they keep their neutrality in this moment," he said. "That will facilitate our relationship in the future." Russia has emerged as Maduro's key international ally in the days since Guaido declared himself leader. Asked about Russia and Turkey, Vecchio said, "They need to understand that this need to be resolved for Venezuela, that 20 years is enough, that they can extend the agony -- I'm referring to the Maduro regime -- but never will it stop the change." --With assistance from Saleha Mohsin, Margaret Talev and Patricia Laya.